Campaigning at the Damen Blue Line with Daniel Biss. Speaking on behalf of our city crossing guards to keep them on the school route. My community service program volunteer and assigned court convicts tend to Logan Square; painting, weeding, cleaning garbage and graffiti. Working with Clean and Green volunteers at Bucktown's Erhler Park. Clean and Green work in South Lakeview neighborhood with the members of SLVN. Talking to Carol Marin about city services. Adding a new bench to our new green space next to the WPB Library with the boys and BCO. Asking CPS Administrators questions about education issues at the City Council Education Committee. Helping out at the Runaway Safeline Thanksgiving dinner for youth - Pastor Abrahamson, Dir. Maureen Blaha and Ald. Tunney. Honoring Chicago Police at the 2015 Gold Star Families Memorial. Bike enforcement with CPD and Bike Ambassadors at the Damen/Milwaukee/North Ave intersection. With members of the Progressive Caucus, Alderman Sawyer and Alderman Munoz. I had hoped to begin this column with reform Ald. Scott Waguespack explaining Chicago’s arcane Rule 14 and how it applies to political corruption and powerful Ald. Edward Burke, who has made a fortune while in public service. A day after the City Council Finance Committee stalled a vote on a plan to limit tax increment financing for major development plans in Chicago, allies of Mayor Rahm Emanuel are expected to vote down the measure that could have blocked tax subsidies for several high-profile projects. The February 2019 Municipal Election is up next on February 26th. If no candidate in the mayoral or aldermanic seats receives a majority of votes (50%+1 vote) in this nonpartisan election, a runoff election will be held on April 2, 2019. 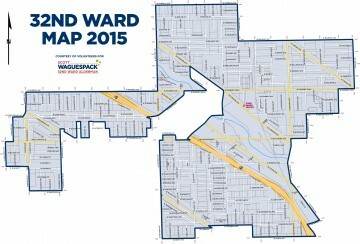 Click here to find your ward, and elected officials and ballot. Be an election judge in the 32nd Ward. You can now apply online to be an election judge. There are several positions open in precincts throughout the ward, and we are always looking for more judges to help voters on election day. We will also need judges in November, and into February 2019 for the municipal elections. Details on the qualifications to be a judge. The online application system is available here. Diversey water main update, LSP historic house walk, save the date on October 11th for flu shots, a few more notes on the proposed $10 Billion borrowing plan, property tax appeal workshop with Commissioner Cabonargi, and alerts from the 19th District station. Last October, Mayor Emanuel broke ground for 312 RiverRun, a project connecting four North Side neighborhoods and three parks with nearly two miles of new bike and pedestrian paths along the riverfront. Mayor Scott Waguespack of Chicago. Dig it. Question: Alderman Waguespack, what do you see as the top five issues for 2017 in Chicago and your 32nd Ward? In a gymnasium packed with city employees and invited community leaders at Malcolm X College Thursday night, Mayor Rahm Emanuel unveiled his three-part strategy to address gun violence in Chicago, leaving out one critical issue facing the city: police reform. Mayor Rahm Emanuel outlined his plan to address Chicago violence Thursday evening to a few hundred people in a gymnasium at Malcolm X College. CHICAGO (CBS) — Aldermen have been summoned to a briefing at City Hall Wednesday morning, believed to be about the hiring of new officers. But some say it could still only be a temporary fix to a shortage issue that could rear its head again soon. CHICAGO (AP) — A task force Chicago Mayor Rahm Emanuel established to look into police practices said the department must acknowledge its racist past and overhaul the way it handles excessive force allegations, as City Council members neared a final vote on Emanuel’s hand-picked choice for chief — an African-American with 27 years on the force. Chicago is facing a fiscal crisis, but it is one that can be fixed. Last Wednesday, I voted “no” on the Emanuel Administration’s proposed 2016City budget. I did it because I have grave concerns about our city’s financial future that I feel strongly this budget failed to responsibly address. Chicago remains one of the wealthiest cities in our country, but such wealth cannot continue to be squandered. Our City Council Progressive Caucus, which I chair, has been advocating for common-sense ideas to direct some of these funds toward crucial programs and services, easing the burden on working families without selling off public assets and privatizing services and jobs that end up costing us more each year. To see another version of the new map, click here for a PDF.